Holiday Shopping that makes a difference! In an effort to put our holiday $’s to good use, we visited the Giving Marketplace at the Bill and Melinda Gates Foundation today. From handmade jewelry to cranberry-orange chocolate bars to coconut body lotions, various non-profits highlighted their good work and offered their products to purchase, all with proceeds going towards making a difference around the world. If you haven’t checked out the Bill and Melinda Gates Foundation yet, go. There are exhibits that interest adults AND children. Very interactive and thought-provoking. In this crazy time where all we can talk about is hate and unrest, it is refreshing to go and see all the good work that this foundation provides to the world. Taking on the real problems that affect lives, the Bill and Melinda Gates Foundation is tackling the big issues of water, poo, natural disaster response, etc. Wouldn’t it be cool if our government cared about this as much? Bill or Melinda Gates for President!!! I also want to support small businesses at home. Instead of driving to the mall and shopping at the big box stores, I’ll be seeking out those little independent stores in Seattle and Boise to fill out my shopping list this year. Yes, it may cost a bit more but it’s worth it. Happy shopping and happy holidays to all! 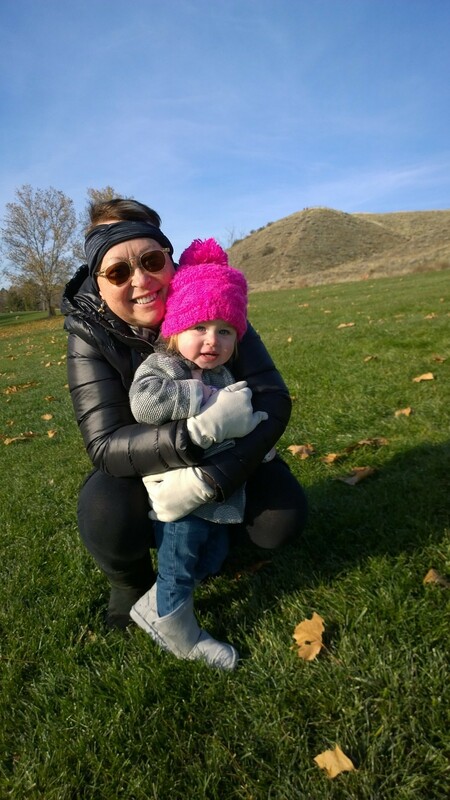 While we are lucky most of the year to enjoy our beautiful place in Seattle overlooking the water, when we come home for the holidays to our house in Boise, we get to revel in family time and experience the rolling foothills, bitter cold (brrrrr!) and snow. Seriously, I brought warm clothes but you can’t dress in enough layers to cope with this frozen tundra crap. And, while Thom is squiring us around town in our cool red Kia that we keep here, the squirrel community has already declined, with more surely to meet their early demise, as seemingly endless supplies of the squirrel population have some freaky death wish to run right in front of our car ALL THE TIME! In speaking with David Sedaris at his recent Seattle talk at Benroya Hall, we explained our daughter lived in Boise, Idaho, to which he reacted by saying something to the effect that the squirrels were stalking him when he visited Boise and seriously, WTF! Yep, the squirrels here are plentiful and crazy but Thom may have a personal hand in changing that status. David, you’ll be safe to return to Boise soon to give an inspiring reading. The day after Thanksgiving, we bundled up to go to the Idaho Food Bank’s fundraiser, Bowls, that is a tradition for many Boise families. People throughout the year decorate bowls and donate them for this event where you spend $10 to buy a bowl and then get soup donated from local restaurants. 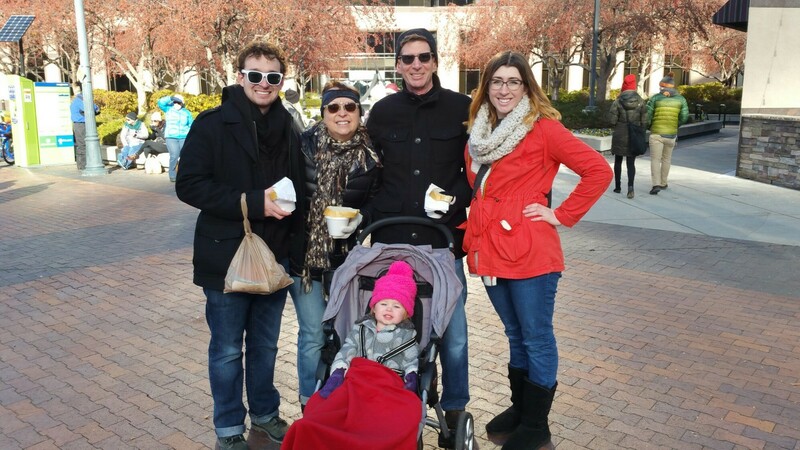 Last year, with temps in the 40’s, it was lovely and we lingered, eating our soup outside. This year, we quickly bought bowls, snagged some soup and ran home to eat. Still, we participated and all proceeds went to a worthy charity, that raised $39,000 last year at this event. Here’s hoping they exceeded that this year! Our social life in Boise differs greatly from Seattle because we are Mia-focused here, soaking up the cutest darling in the world while we can. To say she is the most intelligent, beautiful child would be a vast understatement. She loves to dance and play hide and seek with her Gi Gi and Nai Nai. Mostly on-the-go, sometimes she will consent to sit down to color or read a story. Before the cold wave hit, we enjoyed the park by our house, creeping and crawling through and under tunnels, going up hills and swinging endlessly. 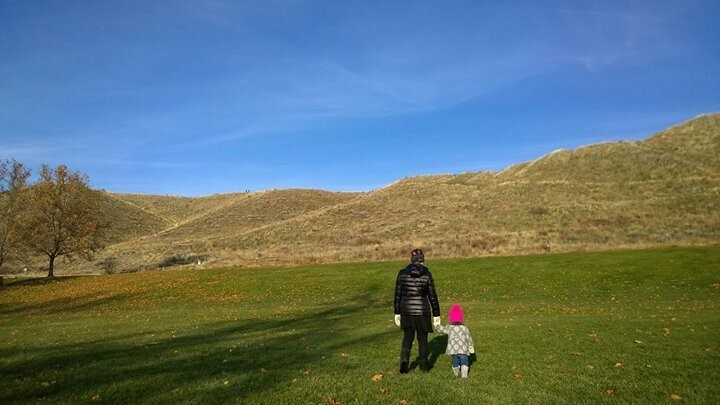 We rent our cottage in Boise most of the year to short term VRBO clients and it’s so popular we had to book it out to use ourselves while we are here in December. Close to the trails and Hyde Park social scene, I can actually walk to the local office here and work remote. With only 800 sq ft, it is a bit small if we moved here full time in the future so we are dreaming of an extension that would allow us to have a family room, modern bathroom and fireplace. I know that clawfoot bathtubs seem romantic and vintage but they are a royal pain to climb in and out of. Death by clawfoot tub-it could happen. Give me a multi-head walk in shower…please! I have to admit I’ve never stepped into the basement where the w/d is located, down a steep set of fold down stairs so that will have to be addressed too in a remodel–no crawling down into creepy space to do laundry for me. Thom, at this point, is calling me out that I rarely do the laundry and, while that is very true, there may be a time when I have to so plan we must for that rare scenario. While we don’t have the urban walks, night clubs, professional sports teams and frequent concert opportunities like we do in Seattle, we did enjoy going to a Boise State basketball game last week that they won handily and plan on trying out a jazz club soon. I found an indie bookstore that was just enchanting in downtown Boise, which is a vibrant place full of shops and restaurants. They even have a vinyl store that, thankfully, Thom has yet to check out. The biggest difference is that with the frigid temps, it discourages the long walks that we love so much. Definitely have to be a gym rat here to stay in shape indoors in the long winter months. Oh well, you adjust and, while we might not love the weather, we do love our family and they are the first priority come snow or rain. So, it’s happy holidays, Boise-style, which means enjoying the Idaho Potato Drop (from a crane downtown) to celebrate New Year’s Eve. Yes, really. When in Idaho…. My what a difference a year makes! Last year on Christmas Eve, we attended one of the few church services offered in Shanghai after a lovely dinner at Lost Heaven with our son James while our daughter Hannah was pregnant and oh so far away in Boise enjoying a quiet holiday with her husband Mike. Fast forward to 2014 and a baby has been born changing all our lives forever. Welcome Mia to your first Christmas Eve with your Nai Nai! 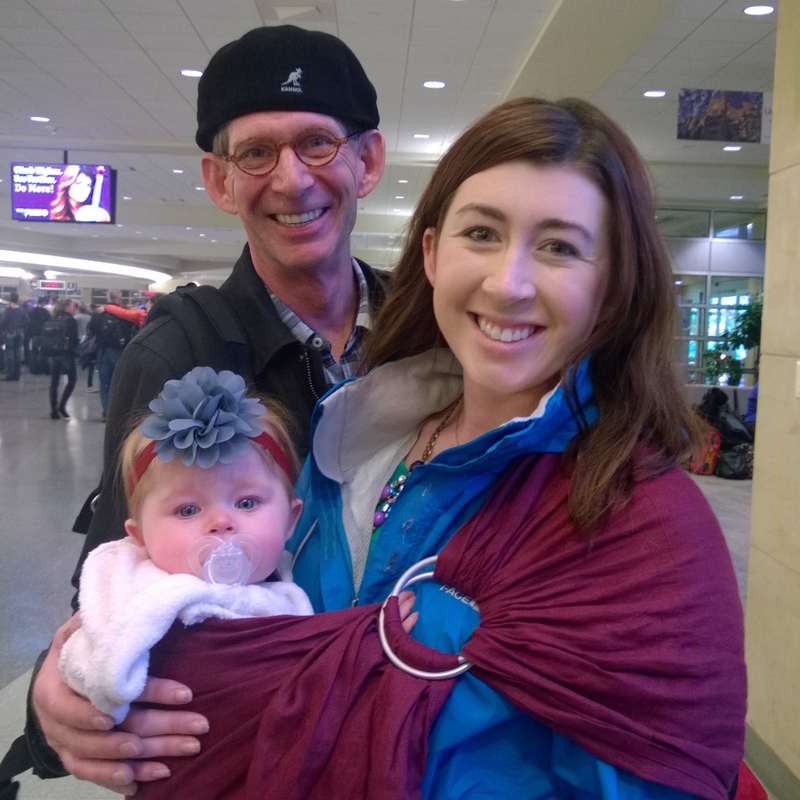 So happy to be with Hannah and Mia and Mike in Boise this year! 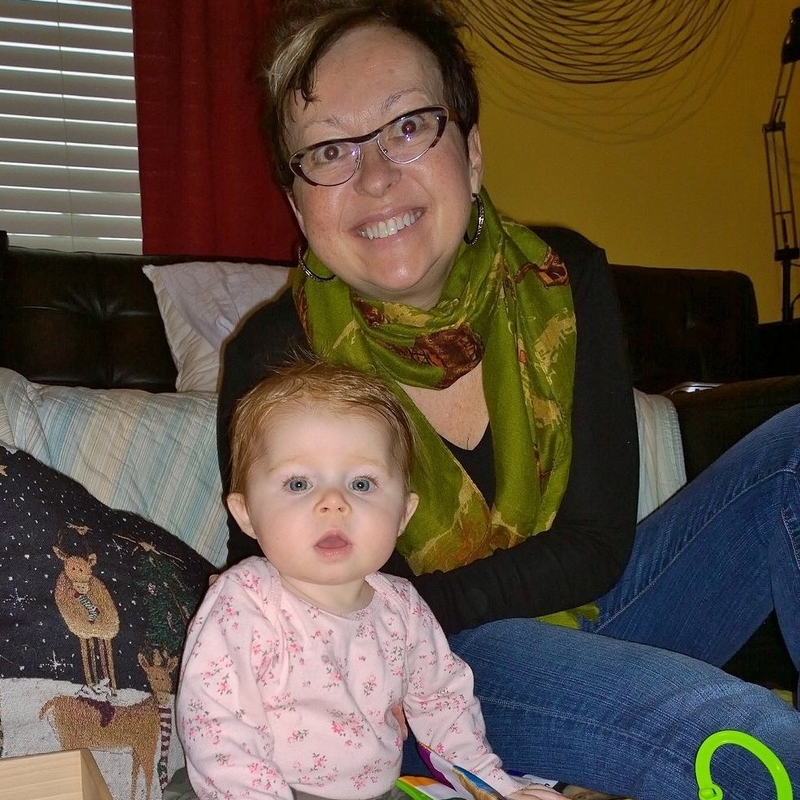 Hannah graciously shared Mia with us this week so we could get to know our girl. 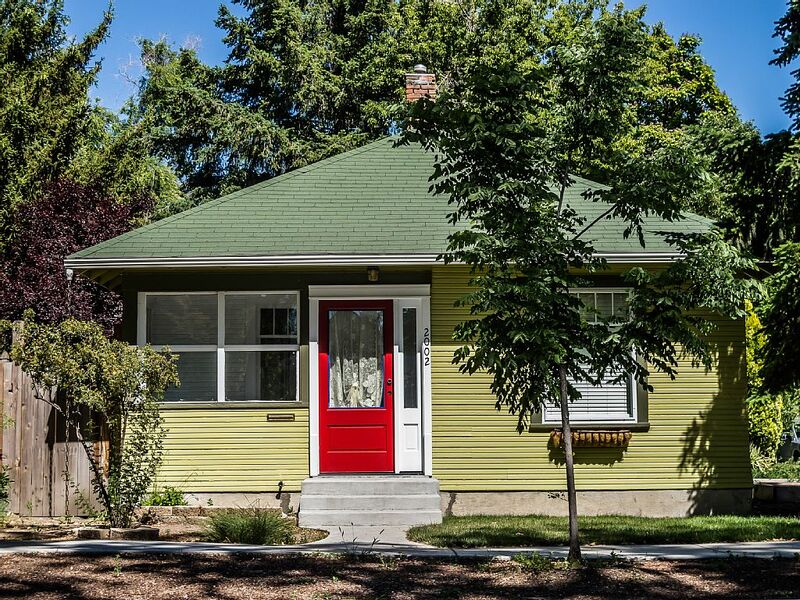 We also enjoyed staying in the house we bought in Boise but had rarely used. It’s filled with all our stuff and since we have been waiting for two months for our China accumulated belongs to arrive from literally a slow boat from China, it was really nice and comforting to see the Broadway posters from our NYC life and the Black Keys/One Republic posters from our Seattle life hanging on the walls. While I try to not care about material things, living out of a suitcase for months on end does grow old at times….. at least until the next adventure comes around! Back to Christmas! This year we are in Boise, it’s snowing hard and we have started new traditions. When the kids were growing up, I normally worked Christmas Eve, being in retail, and the kids would join me at work to hand out candy canes to everyone and then we would eat out and go to church services, coming home to the new pj’s that the elves had laid out carefully on the their beds. 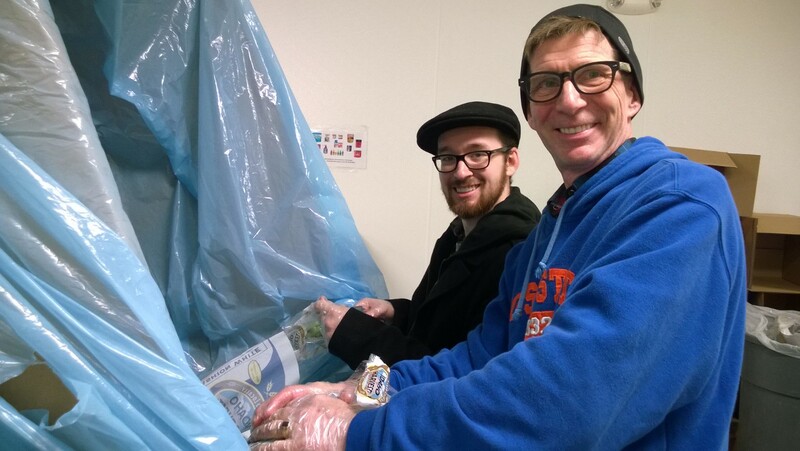 Now that I have a different type of job, we were able to enjoy volunteering today at Mike’s job, the Idaho Food Bank. Stuffing frozen green beans into bags so they could be distributed, it was a gentle reminder to once again count our blessings and make sure we find time in our hectic schedule to help others not so fortunate as we are. Indeed, we are blessed. After quickly wrapping a few gifts, we headed out to dinner (all the meat you can eat!) and then a neighborhood church where the pastor quoted David Brooks from the NY Times so, of course, we loved her. Home to elf-provided pj’s (tradition lives on in Boise!) and a trip through the snow to our lovely cottage while Hannah and Mike continued the Christmas Eve wrapping of presents tradition that we did for so many years for the kids, I’m enjoying a glass of wine and not feeling too sad that all our gifts are already wrapped. Sorry kids! No doubt we miss China and the adventures we had there and the wonderful people we met. But new adventures await and, while there will be gifts exchanged tomorrow, the biggest gift of all is being all together as a family after a separation last year and celebrating the birth of babies–one many, many years ago and more recently, the smartest most beautiful girl in the world, our Mia. Merry, merry Christmas to all! ALL I WANT FOR CHRISTMAS IS SOME CLEAN AIR! Blanketed in smog, the city saw a sunny but cold Christmas Eve with morning temperatures dropping to zero or below in some districts and later increasing to single figures, forecasters said. The air was moderately polluted in the evening along with a rising concentration of particles. The density of main pollutant PM2.5 reached 182. 6 micrograms per cubic meter, or more than double the nation’s limit of 75. 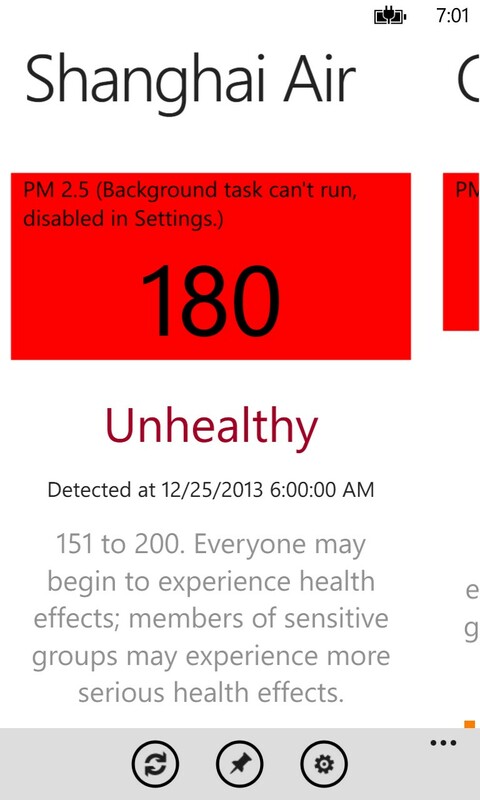 COUGH, COUGH, BURNING EYES & THROAT…ALL I WANT FOR CHRISTMAS IS SOME CLEAN AIR!!! At least I’ll look cute while I inhale the 182.6 micrograms per cubic meter of crap that is in the air today. Instead of a White Christmas, it was more like a Grey Christmas with the sun obscured by the particulate matter as we drove out to the lovely water town on the outskirts of Shanghai. 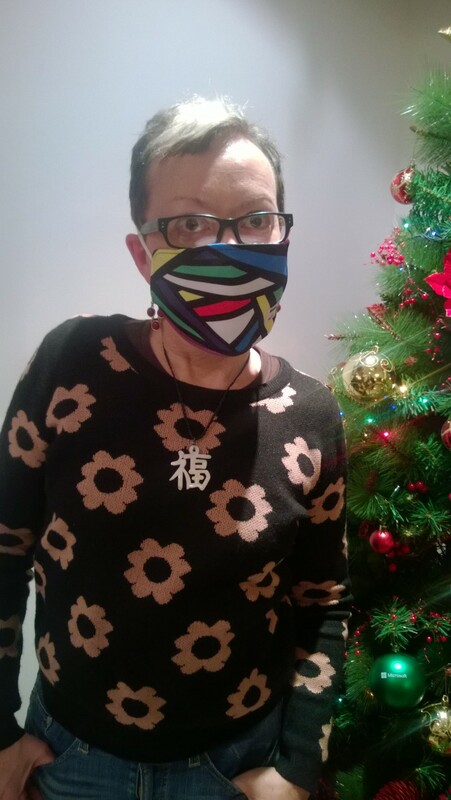 Thanks goodness Santa brought me my new air mask! It’s not exactly the latest technology but it is fashion forward and “pops” with a bright geometric pattern. I might as well try to look decent on the outside because the inside of my lungs can’t be looking pretty after a day like today. This Christmas, instead of hanging by a warm and cozy fire, we’re lucky enough to have a jumbo Blue Air Cleaner to cuddle up to and Elvis Presley’s classic song, “Blue Christmas”, just took on a whole new meaning for me. Some day, God willing, we will once again be blessed to experience a White Christmas with Blue Skies. I just don’t expect it will be in China.